Reliance congratulates employees on achieving Chartered status in their respective professions. 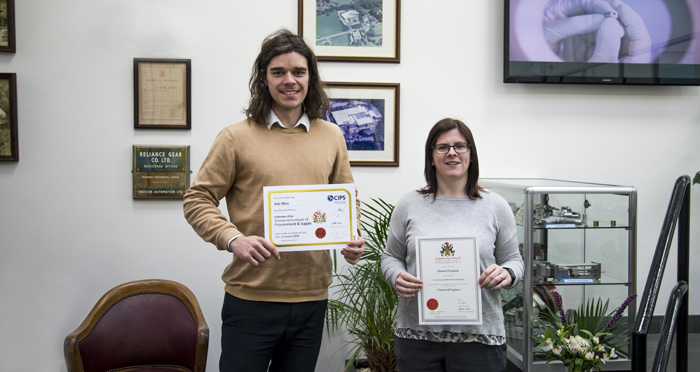 Hannah England, Mechanical Engineer, has achieved her CEng (Chartered Engineer) status with the IMechE (Institute of Mechanical Engineers) and Seb Allen, Senior Buyer, has gained his MCIPS (Member of the Chartered Institute of Procurement & Supply). Hannah decided to study for her CEng after completing a Masters Degree in Mechanical Engineering, acknowledging that an internationally recognised qualification could be a great asset to her future career. Engineers aiming for Chartered status are required to develop answers to engineering problems using new or existing technologies in creative and innovative ways, through the promotion of advanced designs and methods, developing more efficient production techniques and pioneering engineering services. Hannah worked towards the accreditation through the IMechE MPDS (Monitored Professional Development Scheme), a structured programme which facilitates developing engineers in reaching the competence requirements. The mandatory reporting for MPDS includes four quarterly reports and an annual assessment for each year on the scheme. The process culminates in a professional review interview with Chartered Engineers to determine whether the required standards to qualify have been met. The MCIPS (Member of the Chartered Institute of Procurement and Supply) Seb has achieved is one of the most prestigious a professional purchaser can earn. He studied via classroom-based and distance learning over a three year period, undertaking quarterly exams over the course of this time. Modules included project & programme management, business & procurement strategy, and the legal aspects of procurement and supply, as well as skill development in areas such as negotiation techniques, issues relating to procurement sustainability and supplier financial analysis.